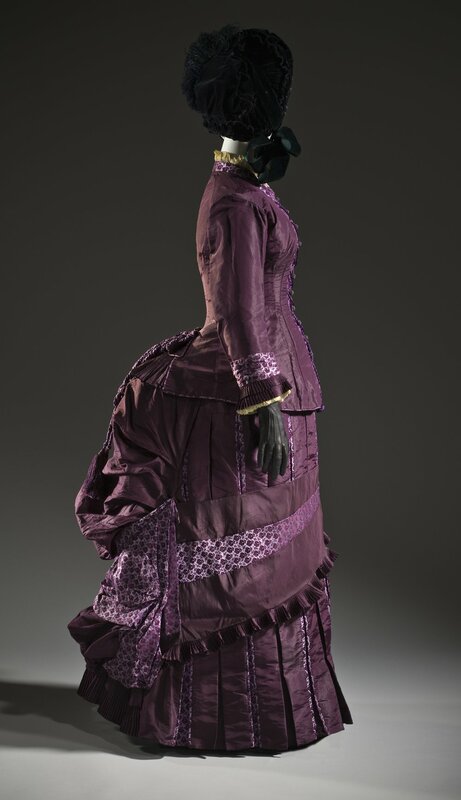 For our next two blog posts, we’ll be taking a look at Western fashion over a hundred year period, from 1850-1950. 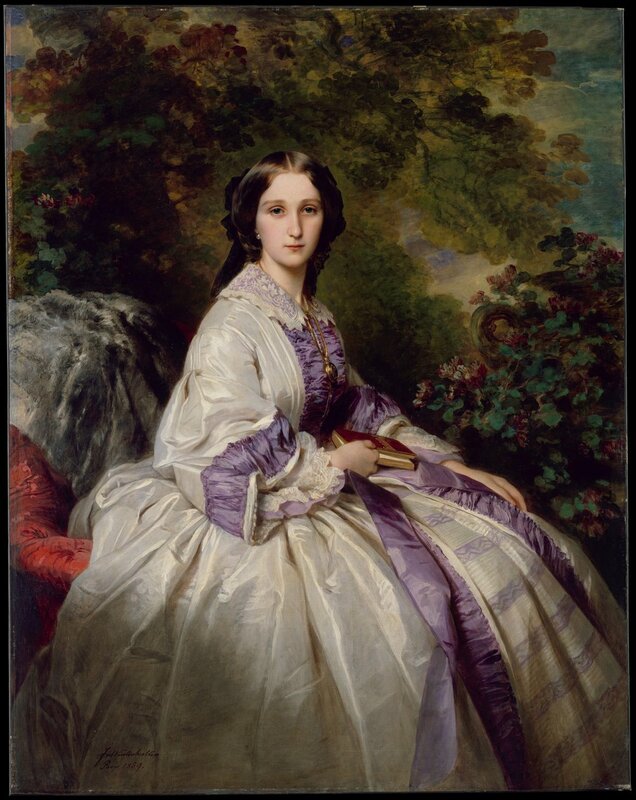 Fashion was a reflection of social and economic class and changes in the Western World. This blog post and next week’s will examine the pre-Civil War period through the turn of the century up until the rise of counter cultures in the latter half of the 20th century. It is far beyond the scope of a simple blog post to analyze global fashions during each decade. It would be worthy of a book or a series of books. For this post, we’ll stick to the fairly homogenous concept of “Western Fashion,” which primarily encompasses Western Europe and North America and the fashion capitals of Paris, London, and New York. The United States was experiencing an economic boom brought on by mass migration to the American West. Tensions between pro-slavery and abolitionists became more violent and more frequent. The first commercially successful sewing machine was available, which made the machine affordable enough to begin being used in homes and cut apparel-making to a fraction of the time. 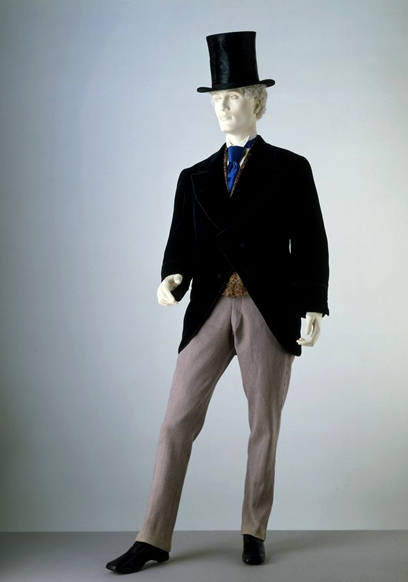 During this time, male fashion was influenced by the fashion of London, while women’s fashions came from Paris. 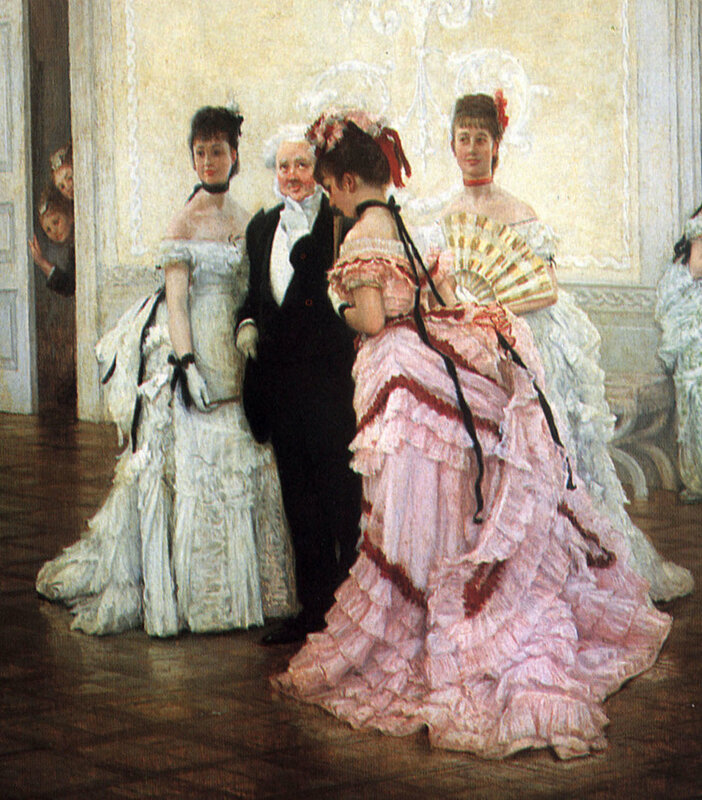 The feminine silhouette was dome- or bell-shaped, which was created with several layers of crinoline petticoats, and later in the decade, steel cage crinolines. Skirts used tiers and flounces to increase fullness. Later, when steel cage petticoats came into fashion, the skirt was smoother. Evening gowns were low-cut with short sleeves while daywear had high necklines and long sleeves. Tight corsets countered and emphasized the large skirts. Dresses were decorated with lace, ruches, and ribbons. Women styled their hair with a center part, side curls, and a bun. Men wore matching sets of a coat, vest, and trousers. Single-breasted frock coats were snug and form-fitting, while sack coats, loose-fitting, thigh-length coats, began to gain some traction during this decade. 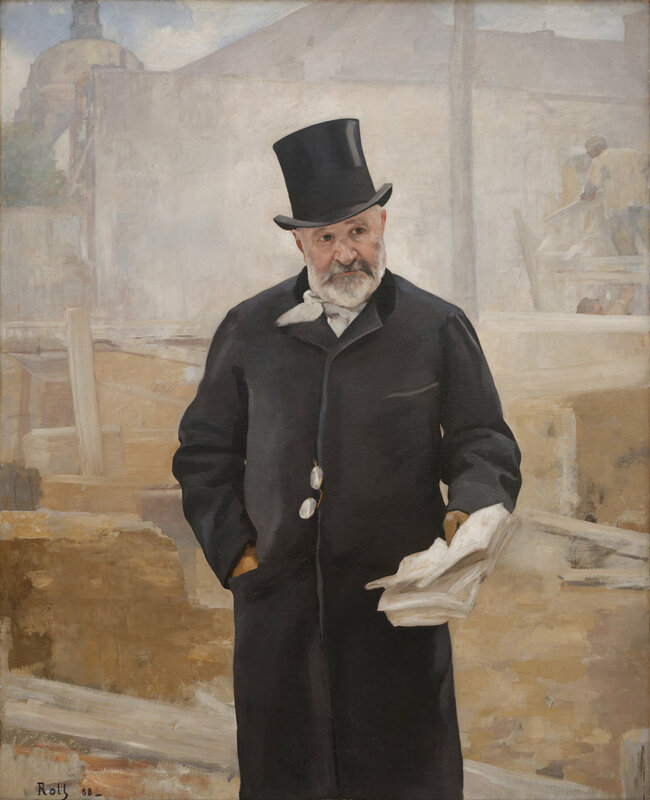 The sack coat would later become the modern suit coat. 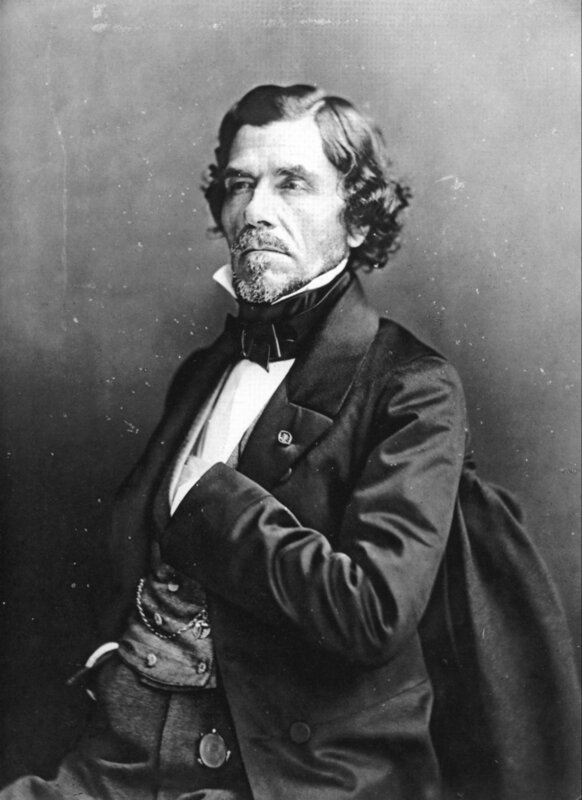 Suits had high, stiff collars and were decorated with large bow ties. Top hats were worn by the upper classes and bowler hats were worn by the working class. Men styled their facial hair into mutton-chop sideburns and mustaches. The Civil War in the first part of the 1860s in the United States caused a serious shift in the way of life. The result was the reunification of the North and South United States and the abolition of slavery. During this decade, the transcontinental railroad was completed, bicycles gained popularity, and the Victorian Era began. The dome-shaped silhouette of the previous era changed mid-decade, shifting the emphasis towards the back of the dress. The tight bodices with high necks in daywear continued, but front-button shirts became more popular. Tops emphasized low, sloping shoulders and also had wide, flared sleeves, decorated with white lace collars and cuffs. Material for the wealthy and upper classes was heavy silks in solid colors. Men’s coats were single-breasted (one row of buttons with less overlap than double-breasted, which has two rows of buttons) and semi-fitted, a compromise between the previous era’s tight frock coat and loose sack coat. These jackets reached mid-thigh. Waistcoats were collarless. Undershirts had high, starched collars paired with cravats or neckties. A style known as Dundreary or Piccadilly whiskers became fashionable for facial hair. Race relations continued to evolve in the United States with Reconstruction and segregation. Important inventions of the era included the telephone and the lightbulb. 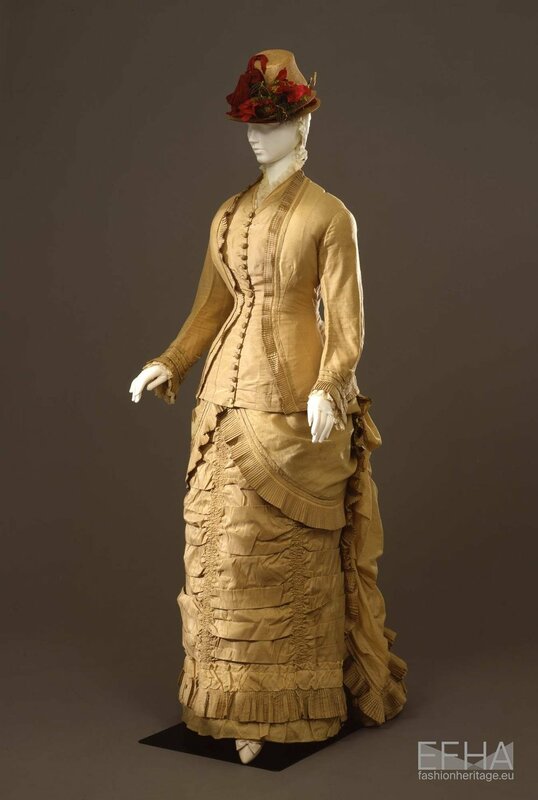 The silhouette for women’s fashion continued to shift towards the back of the skirt, with the bustle, ruching, ruffles, and flounces emphasizing this look. The waist moved lower, the front of the skirt became flat, and the bodice became elongated, all to emphasize this large skirt back. However, this style fell out of favor quickly in favor of a tight-fitting silhouette later in the decade. Hats were small and tilted forward on the head. Men’s fashion was very similar to the previous decade. The tips of shirt collars were pressed into wings. Coats had wider lapels and fastened lower on the chest. Bow ties were increasingly replaced with neck ties and ascots. The 1880s saw the first automobile, the vast expansion of the railroad, immigration, and the Wild West. The Victorian Era wouldn’t end for another twenty years. Dresses of this era had tight bodices, narrow sleeves, and high necklines (a show of modesty characteristic of the Victorian Era). Focus remained on the back of the dress and the bustle came back in an extreme way mid-decade before falling back out of fashion quickly. The corset was still an S-shape, but was emphasized with a lower chest. Choker necklaces and collars became fashionable accessories. It should come as no surprise that the Rational Dress Society was formed in 1881 in opposition to extreme forms of women’s clothing. Slim lounge suits were popular among men. The jackets would be worn open or partially undone to reveal their vests and neck or bow ties. A more relaxed suit appeared mid-decade and the working class adopted jackets and vests as well. The 1890s saw a number of inventions and movements, from the Temperance Movement to the creation of motion pictures to the commercial production of automobiles. However, what more defined the decade is an economic depression. This decade would later be called the “Gay Nineties,” a misnomer as the decade saw an increase in crime and a rise in poverty. There were also many strikes and labor disputes that took place throughout the decade. The better term is the “Gilded Age,” referring to its shiny exterior hiding a bad situation. 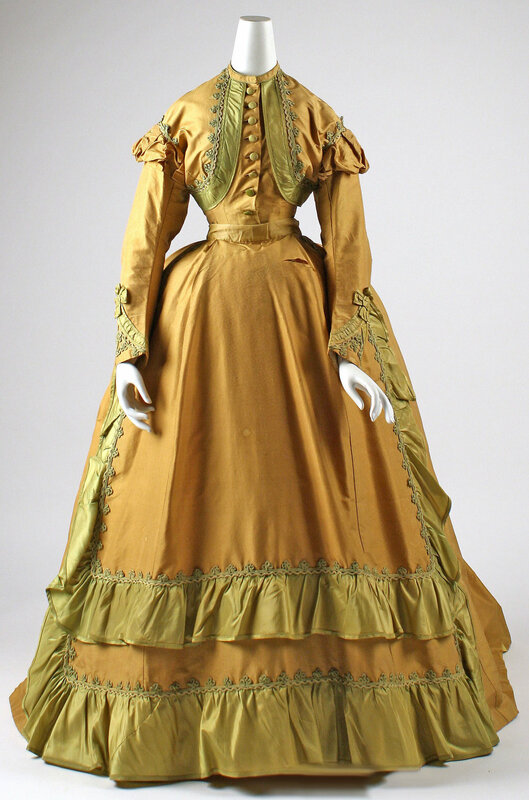 The fashion of the early 1890s looked much like the fashion of the previous decade. However, over the course of the next ten years, the leg-o-mutton style sleeve (narrow around the lower arm, puffy around the upper arm) increased in popularity and volume. Fashions emphasized a wide shoulder and combined this with an A-line skirt (A-line meaning the skirt took the shape of a capital A). 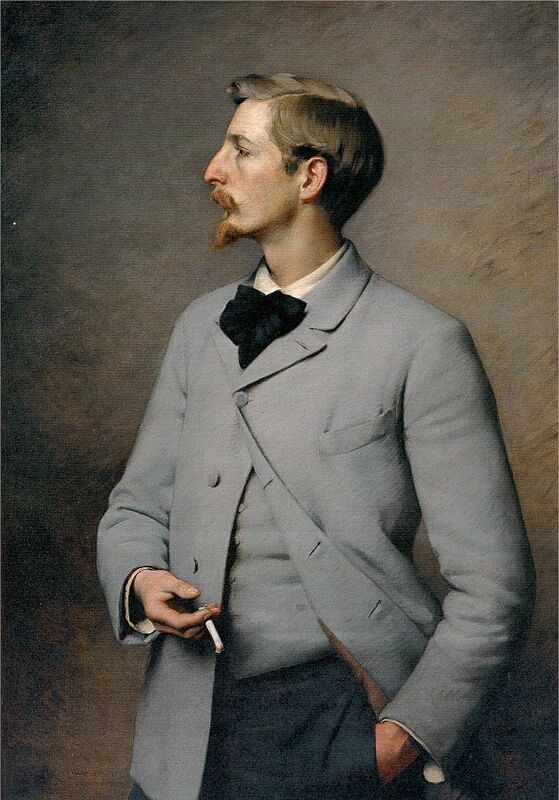 More masculine styles were also adopted, including shirt collars and ties. Men’s styles started to become more comfortable and less restricted. Starched collars gave way to turned-down collars. Three-piece suits became more popular while frock coats fell out of favor. Creases started to appear at the front of pants. Beards began falling out of fashion among men’s facial hair stylings. Heavy mustaches or clean shaven styles were preferred. Next week, we’ll examine fashions from 1900-1950. If you want to see one hundred years of fashion from our local region, come visit the museum for our Fabric of Bradley County exhibit from March 2019-June 2019.